Quick Assessments are short, standards-aligned, and have engaging tasks that students can complete within a short amount of time. Teachers use Quick Assessments in Goalbook Pathways to assess student learning connected to a specific critical standard at multiple depth of knowledge levels (DOK). This release gives teachers accessible texts that are rich and engaging but are also more easily decodable and comprehensible for students who may not be reading at their instructional level. This means teachers have options for students who struggle with reading but don’t have to sacrifice engagement nor rigor. What makes these passages accessible? 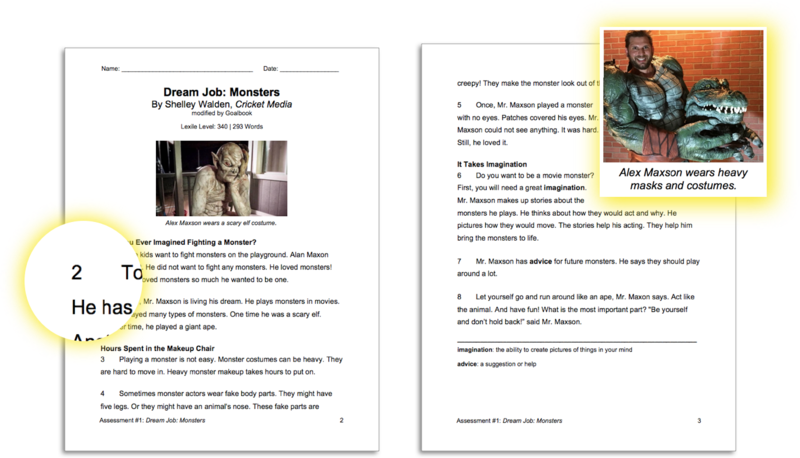 We are excited to announce the addition of these 32 NEW Reading Quick Assessments because they are a brand new type of quick assessment with Accessible texts. They will be available alongside the existing assessments for the Reading Informational Texts standards concerned with citing text evidence and the Reading Literature standards concerned with the central ideas. Text Features: The UDL guideline of providing multiple means of representation was applied to the visual treatment of headings, images, font size, whitespace, text length, and numbered paragraphs. Familiar and Relatable Topics: The subject of the passage is accessible because it doesn’t require readers to have a unique schema prior to reading the text. In the case of nonfiction texts this also means that the topic is well defined. Clear, Coherent, and Direct Assessment Questions: The assessment items are written in accessible language that doesn’t get in the way of students communicating their understanding. Standard Alignment: Questions and tasks are tightly aligned to the standard and maintain a high level of rigor. Explicit context building helps students access specific information within passages. Ensuring that all students can access texts means teachers must curate texts that don’t merely match a students’ reading level but also take into account the functional elements like presentation and schema that have the potential to present significant barriers to success. These Quick Assessments aid teachers in that curation process. 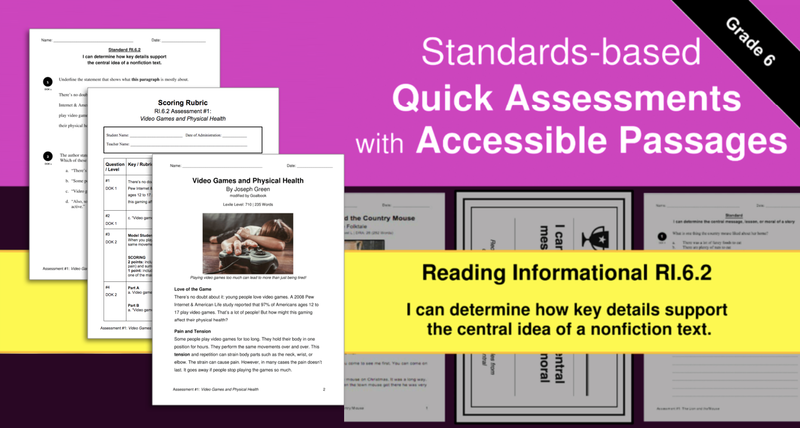 There are 32 New Reading Quick Assessments with Accessible Passages! Below you’ll find examples of these new quick assessments. Excerpt from From the Notebooks of Melanin Sun By Jaqueline Woodson: RL.6.1- Cite textual evidence to support text analysis. Plastic Is Poisoning Coral Reefs By Bright Katz: RI.6.1 Cite textual evidence to support text analysis. Excerpt from Solo By Kwame Alexander: RL.9–10.2 Analyze how themes are developed in a literary text. 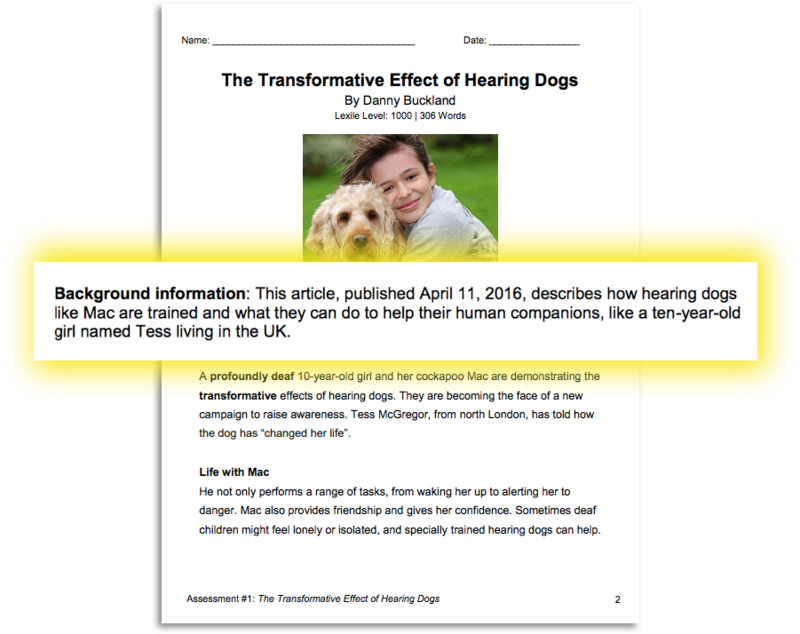 The Transformative Effect of Hearing Dogs By Danny Buckland: RI.9–10.1: Analyze how a central idea is developed using details.